This machine can clean and oil the parallel shank or bending handpiece accurately and easily at any time. It has the character of high security, easily operating, easily commandeering, and any person can operate it. 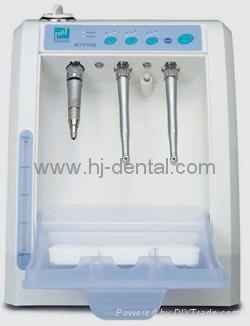 Three dental handpieces can be oiled and cleaned at the same time. Swing pinion of the ZT-BTY700 can effectively clean and oil the dental handpiece from different angles. Having completed the procedure of the cleaning and oiling, the remained oil can be cleared by pressing the air key. Different handpieces can be oiled by choosing the short mode, the long mode, and the longer mode. Oil mist fifration cotton can prevent the least diffusing of the oil mist.